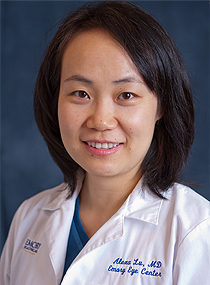 Xiaoqin Alexa Lu, MD, joined the section of Comprehensive Ophthalmology of the Emory Eye Center and the Department of Ophthalmology on March 1, 2012. Dr. Lu served as an assistant professor of ophthalmology at Shiley Eye Center/VA Health Systems in La Jolla, California/University of California, San Diego Hillcrest Hospital in 2006-07 and as an assistant professor of ophthalmology at the University of Pittsburgh, School of Medicine from 2007-10. Her research interests include telemedicine and international eye care. At Cornell, Dr. Lu was awarded the Cornell Traditions Fellowship and the Blanche Savin Goldenberg Fellowship in 1995-96. She is board certified in ophthalmology by the American Board of Ophthalmology (2008).